Looking for a romantic weekend getaway? If so, we highly recommend visiting Niagara Falls in New York. If you live in central Pennsylvania, you can reach Niagara Falls by car in 6 to 7 1/2 hours, depending on the route that you take and traffic. We wanted to celebrate our wedding anniversary so we arrived around 1 PM on a Friday and checked out of our hotel around lunchtime on Sunday. We stayed at the luxurious Seneca Niagara Resort and Casino which is beautifully located within a short walk from Niagara Falls State Park. Our suite was spaceous and included a whirlpool tub, sitting area, comfortable bed, large shower & bathroom, and we had a scenic view of the area. Our room was beautifully decorated and extremely clean! During our stay we had fun playing games in the casino, visiting the spa and on one evening we enjoyed a delicious dinner at La Cascata, which offers fine Italian dining. If you love Italian food, La Cascata is definitely the place to be. Everything about this restaurant is top-notch and then some! We loved the Seneca Niagara Resort & Casino and will definitely stay there again when visiting the area. Friday evening we took a walk and stumbled upon the Niagara Falls Haunted House attraction. It's located within walking distance from the State Park. You pay an admission fee and go inside the haunted house for some scary fun. Okay, it wasn't too scary at all, but it was definitely a fun thing to do during our trip! On Saturday we headed down to Niagara Falls State Park and walked around for several hours. There are monuments, park benches and tourist attractions right inside the park. We enjoyed the "paid" trolley tour through the park which was really nice. You'll find a gift shop, walking trails, the trolley tour and the Maid of the Mist boat tours all located within the park. The weather on Saturday was beautiful, so we decided to pay the admission fee and take a ride on the Maid of the Mist. This boat tour gets you up close and personal with the bottom of the waterfalls. 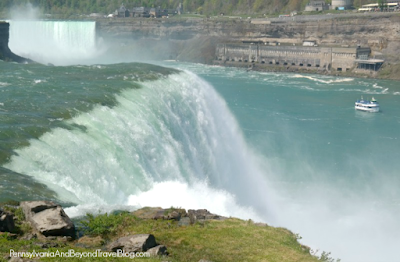 You'll get stunning views of the American Falls, Bridal Veil Falls and Horseshoe Falls. They will give you a plastic rain jacket to wear during your boat ride and trust me, you want to wear it. You will get wet!!! We highly recommend the Maid of the Mist boat tours when visiting the falls. While walking back to our hotel we stumbled upon the Niagara Wax Museum of History and decided to go in. On the day that we visited, we were the ONLY customers there. We were able to take our time through the entire museum checking out all of the beautiful exhibits. If you enjoy wax museums, you'll enjoy this one, especially with its Niagara Falls twists and history. After visiting the museum, you can do some souvenir shopping in their on-site gift shop which offers jewelry, home decor, toiletries, gifts, books, souvenirs and collectibles. To round off our day...we decided to have dinner at the Hard Rock Cafe which was pretty busy when we arrived. It took awhile for us to get seated and the wait-staff was a tad slow. Regardless, we ordered burgers and fries, and enjoyed our meals. If you're looking for casual dining that offers your classic American cuisine, the Hard Rock Cafe is the place to be. 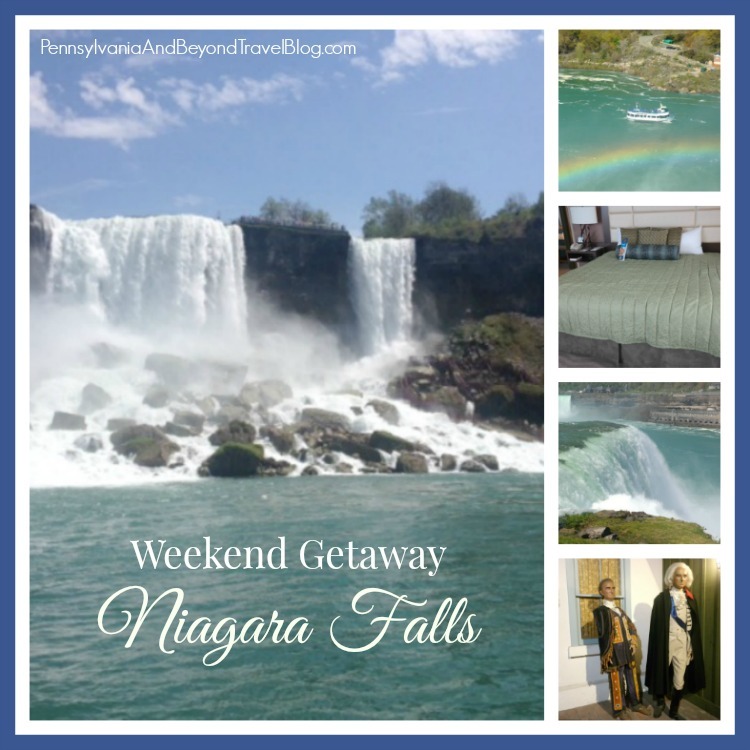 We spent 48 hours in Niagara Falls, New York and had a wonderful time. 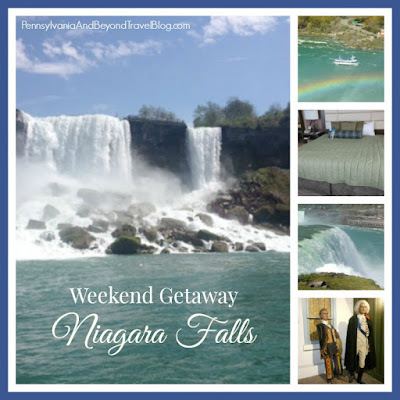 There are a lot of cool things to see and do in this old, historic town and Niagara Falls should be on every traveler's bucket list. We are hoping to visit again in the very near future, perhaps on our upcoming 35th wedding anniversary next year.